Ever since I had my baby it seems that everywhere I go people want to hold her. I get it -- people love babies but I'm going to be honest, I have a hard time letting people hold her and even when people I know are holding her I'm just waiting for the moment I can grab her again. Before you think I'm crazy for feeling this way, hear me out. When my baby was born I didn't want anyone to hold her. Anyone. She was this tiny, fragile human being and I wanted her by my side all the time. My instincts to protect her were so strong it felt primal. I'm sure I was also on some hormonal high that made me want to protect her even more. 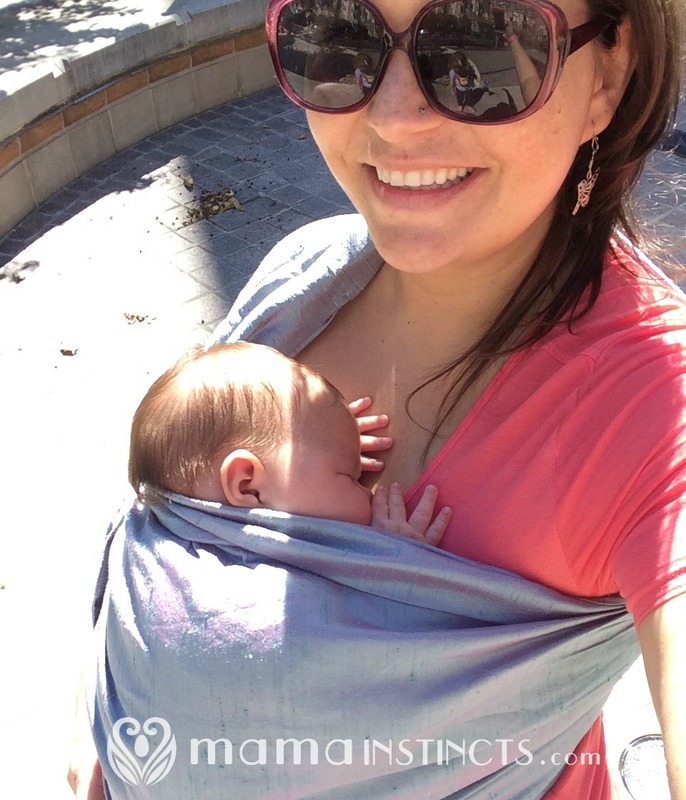 When you become a mom you know when your baby is hungry, uncomfortable or scared. You learn to recognize the specific sounds they make, which to most sound like baby babble but to a mother they mean different things. When I heard my newborn making a distinct "eh" I knew it meant she was hungry, other times I knew she was uncomfortable or needed a diaper change. You just develop an instinct that connects you with your baby. Many times when I wanted to take her back people would tell me "but she's not crying." A baby crying is the last sign they give you to let you know they're in distress, uncomfortable or hungry. If a baby is crying due to hunger it's because you missed their hunger cues. In other words, you realized too late the baby was hungry. When I told people to hand her over so I could feed her most of them told me "but she just ate." Well she is a breastfed baby and breastfed babies nurse A LOT, especially at the beginning. Imagine you had a tiny stomach and was filling it only with liquids. You would be hungry pretty often. As she got older, around 4 months, I started feeling more comfortable with certain people holding her to the point where I didn't have to pretend that I was fine with it because I really didn't mind. Of course I wanted to be able to see her in case she needed something. Then came the age where she started having a little separation anxiety, around 7-8 months, and again my instincts kicked in. I would always lean my baby towards the person that wanted to hold her but if she didn't stretch her arms towards them I'd take it as if she didn't want to be held by that person. I like to respect my baby's wishes and since she couldn't speak this was a great way for me to know what she felt and wanted. However, not all people respected this and sometimes I had people just take her away from my arms. I do not understand what makes anyone think they have the right to grab someone else's baby. Some people started telling me: "take a break" or "enjoy this break" while taking the baby away from me. I don't need a break and if I do need one, believe me, I'll let someone know. I might sound a little possessive but it is my job to protect my daughter. I am the one that takes care of her and if she's scared or sick I am the one dealing with it, not anyone else. There were times when I struggled setting boundaries or felt like I had to let family members hold the baby but eventually I learned that if it doesn't feel right to you, you don't have to do it. Find the courage to honor your instincts. Not all moms might feel the same way I do. Moms that have to work outside the home might get over this sooner because they have to learn to trust other people with their babies. Some others probably don't feel it at all. Who knows! All I know is that I feel this way and that it is completely normal. Eventually, there comes a day when moms feel more comfortable with others holding their baby, but this comes with time and as the baby grows older. We are our child's protector, they can't defend themselves nor speak nor walk on their own. Until my baby can communicate I will always feel like I have to make sure her wishes as well as my instincts are respected. If there is one thing I've learned in this journey is to trust my instincts, even if I don't understand why I feel them. If you see a baby, even if it's from a family member, don't ask if you can hold the baby. You can smile at the baby and play with the baby while the mom is holding her. Believe me, if the mom wants you to hold the baby she will tell you. This post originally appeared on Mama instincts. Like Mama instincts on Facebook for more posts like this and follow our parenting adventures on Instagram.